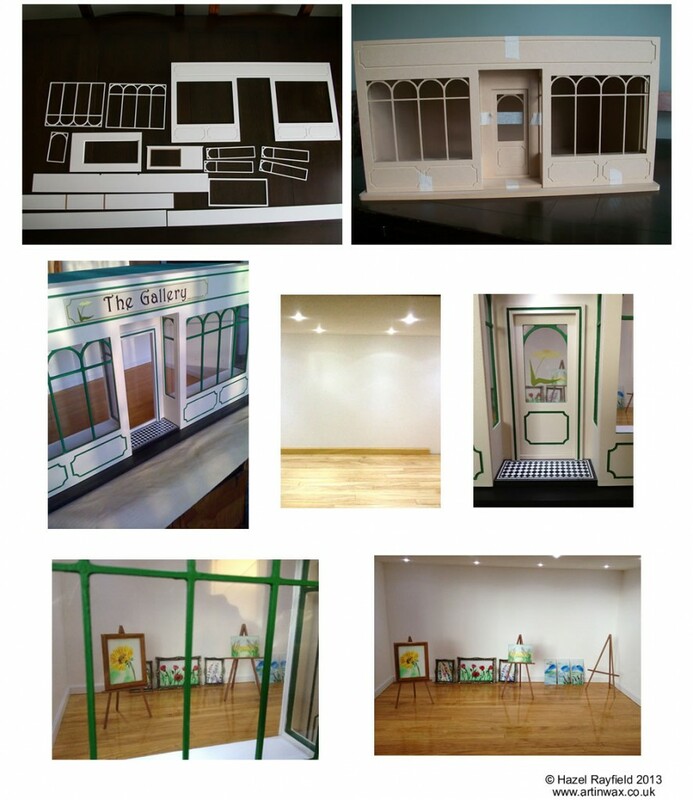 We have been building a 1:12 scale miniature gallery to house my miniature artwork called The Gallery. The workmen are now finished in the gallery and we are getting ready for the Grand Opening. My husband Adrian has been the builder, decorator and everything else, I helped design the signage but everything else is down to him, and he has made a wonderful place to display and show my art. Below are some of the work in progress pictures from our 1:12 scale gallery. 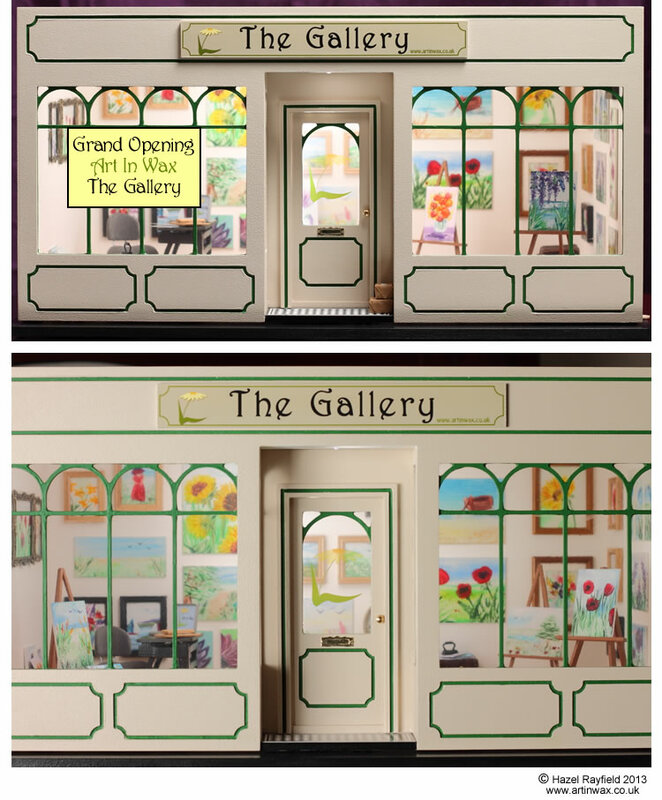 We bought an MDF kit for a Victorian shop and created a contemporary modern gallery space to house my miniature art. The Gallery has spots lights set into the ceiling, and the windows and over the front door, a varnished wooden floor, laid piece by piece by Adrian together with clean white for the interior and a Sandstone exterior with Green for the paneling and windows. A flat roof tops its off together with signage and a tiled effect door step, which I really like and Adrian digitally made in the period style. Please see the next blog post for the finished project …… with the walls filled with art. We, Adrian and I have created some miniature easels to display my tiny paintings on, the easels are made from scratch, in hard wood, my husband is very clever ……. I have the vision and he designed and made them. The easels are approx 140mm high which equates to about 5 and a half feet , which would be about right for a painting easel I think …….. The “Country Path” miniature painting shown above is on sale in my Art In Wax shop together with various other subjects and sizes. 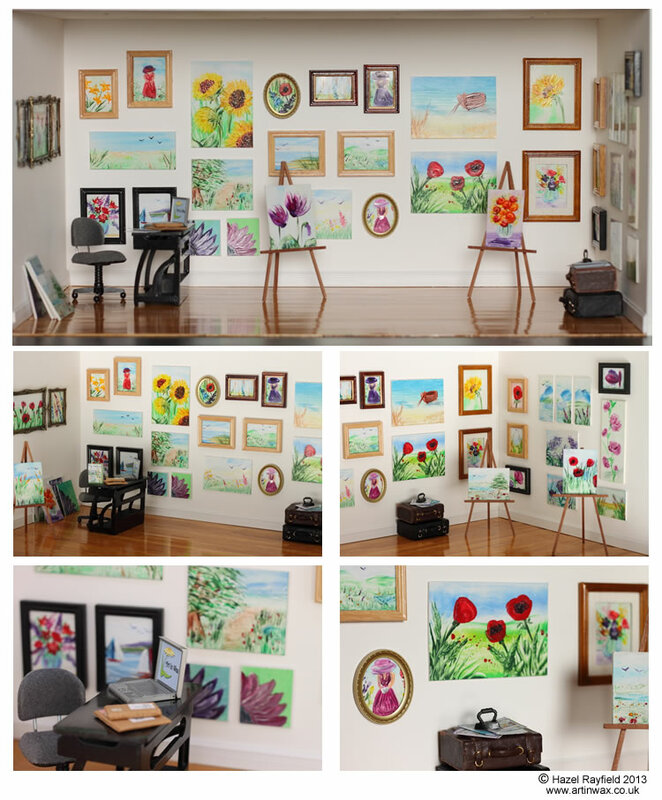 Shop : miniature dollhouse art. The “Sea View” painting is currently in my Etsy store, which is available for UK and International orders, this painting size is 57 mm x 45 mm – 2 1/4 x 1 3/4 inches approx. If you would like to own a piece of Art In Wax, miniature or otherwise, I have lots on line or you can contact me for details of how to arrange a commission.